Tinsley Bridge, working with the University of Sheffield’s Advanced Manufacturing Research Centre (AMRC), has embarked upon a project which will demonstrate that artificial intelligence (AI) and machine learning are valuable tools to improve manufacturing productivity; not only for industry’s big players, but for SMEs as well. The company has joined forces with engineers at the AMRC’s Factory 2050, who are using AI to learn what machine utilisation looks like on the shop floor of the Sheffield-based SME, which specialises in large-scale engineering for challenging environments. A demonstrator will be created to highlight the accessibility of Industry 4.0 technologies to other SMEs in the region, and the potential positive impact on shop-floor productivity. In actual fact, the demonstrator will be the first created under an emerging AI strategy being produced at Factory 2050, which seeks to harness the work being done with AI and machine learning techniques across the AMRC, and provide real use-cases for these techniques in industrial environments. Data from edge-computing devices at Tinsley Bridge was sent to the AMRC’s cloud computing services and, using the latest data science techniques, ran through an AI algorithm to provide new insights for the control and monitoring of manufacturing processes. Analysing the power signatures from the data, the algorithm looked for repeat patterns or anomalies, working out how many components were machined, and deducing that three different types of part were manufactured. 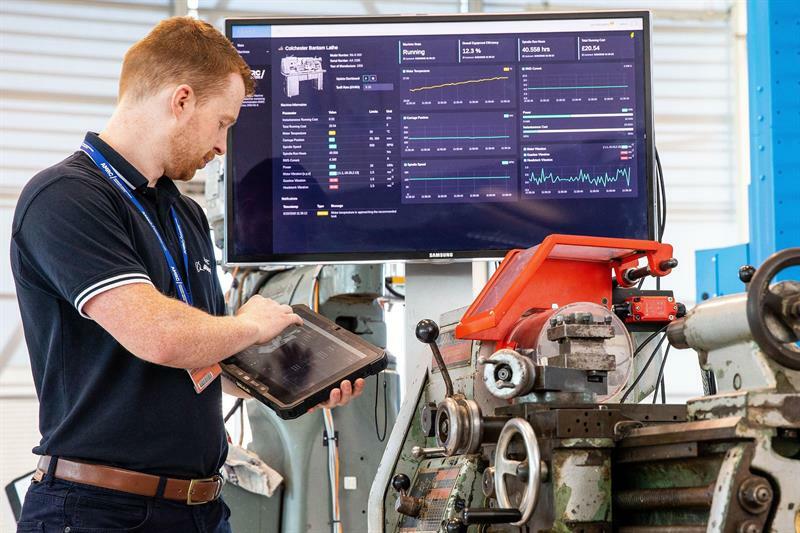 “The project demonstrates to industry that, with a low-cost device collating quite simple data, AI and machine learning can be used to create valuable insights from this data for the manufacturer,” says Coles. Aiden Lockwood, chief enterprise architect for the AMRC Group, says the project demonstrator will show other SMEs how easily and cheaply Industry 4.0 technologies can be accessed: “Traditionally, these tools were built into commercial packages which could be out of reach for some SMEs, so there is a misunderstanding that Industry 4.0 manufacturing techniques are only for big players who handle incredibly complex data collected over a long period of time. However, AI is evolving and these techniques now give smaller businesses the ability to do so much more with their data. In this project we are using a simple data set, collected over a short period of time, to provide real benefits for the company. “The formation of our AI strategy will allow us to lead the way in developing new capabilities and bringing the academic, technology and business communities of the region together to educate and demonstrate AI technologies for manufacturing industries,” he adds. The next phase of the project will see the engineers at the AMRC train the system further, so the algorithm can detect non-conforming components while in production, or identify a problem when a machine requires intervention, such as when a tool is showing inconsistent wear and impacting component quality. Crow adds: “We started out with the aim of finding out about retrofitting our machines for data capture, to give us an idea of machine utilisation so that we could optimise production schedules. However, as the project moves forward, we expect to gain even more visibility around our production processes so we can begin to move towards a predictive maintenance model in our machine shop that will provide improvements in quality and process capability. “The insights provided by AI will allow us to identify when our machines will require intervention for tool changes, or how long we can run them without intervention,” he adds. “Predicting tool failure and prolonging tool life will also affect our right-first-time rates, reducing non-confirming parts and boosting productivity.